Hi everyone! Audrey here with our Watch Us Wednesday tutorial at The Kraft Journal. 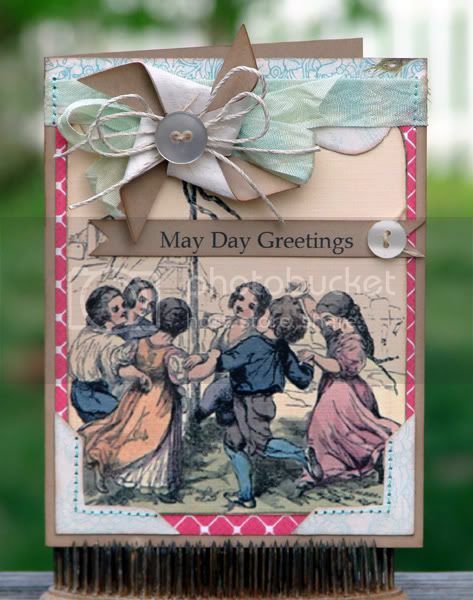 For our theme challenge this week, I created a traditional May Day greeting card using a great vintage image, pretty papers, and my favorite cardstock and trim from The Kraft Outlet. Brown Kraft Coverweight Cardstock and patterned paper forms a background for this maypole scene printed on Buff Ivory Cardstock and dressed with photo corners, machine stitching, buttons, and a bow. But by far the true star of the show is the fun pinwheel at the top of the pole. Want to learn how to make one? I'll show you how. If you’d like to create a pinwheel of your own, it’s really an easy process, and you can make a pinwheel in any size you wish, from teeny tiny to ultra large. Simply start with a perfect square of pattern paper or cardstock. I used a 2″ square for mine. 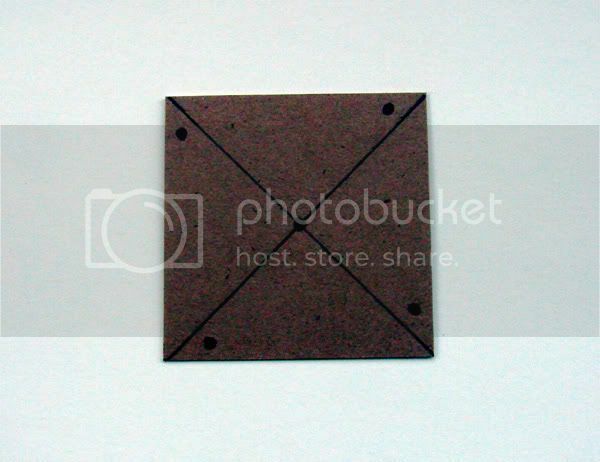 Using a pencil and ruler, draw an X through the center of your square piece. Put a pencil dot in the exact center and in each corner as shown here. Punch a hole in each dot using a 1/8″ circle punch and then using your scissors, cut approximately half way up each drawn line towards the center. Erase your pencil marks. 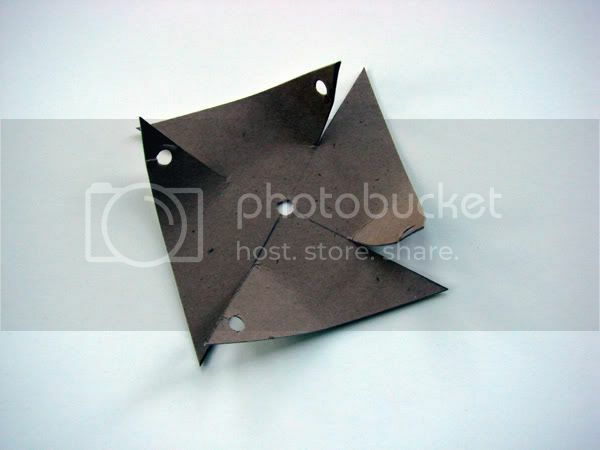 Place a brad in the center hole, prongs facing up, and then bend each punched corner onto the prongs in the center. Secure the brad once all the corners have been folded up. For my pinwheel, I wanted a double-sided pattern, so I adhered a square of patterned paper to the cardstock before I folded up my arms. Using a double-sided paper would work great for this, but since my papers were single-sided, I needed two squares to get the look I was aiming for. Once my pinwheel was finished, I added a bow of Earthy Hemp Cord and a button to cover up the arms of the brad and layered it over a strip of Victoria Seam Binding spritzed with Sky Blue Glimmer Mist to match my papers. 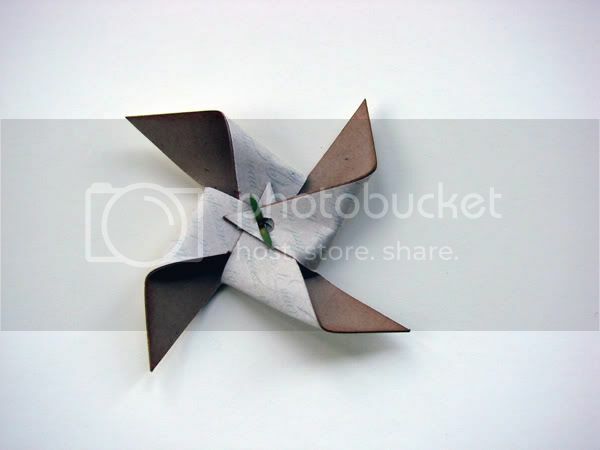 Hope I've inspired you to give pinwheels a try on your next crafty project. And don't forget there's still time to enter our May Day challenge. You have until 6 pm on Sunday May 1st to upload your projects. Can't wait to see what you all make! (The link to our current challenge is located in the right hand top sidebar of our blog). Great tutorial Audrey! Very easy to understand and wonderful results. Your card is beautiful! Hugs! Love your card and pin wheel Audrey! TFS! Fun idea and looks so easy to do, thanks for the fantastic instructions!! love this card :) thank you for the pinwheel tutorial too!